My aunt was a very keen gardener and her garden was full of interesting plants and ambitious design. 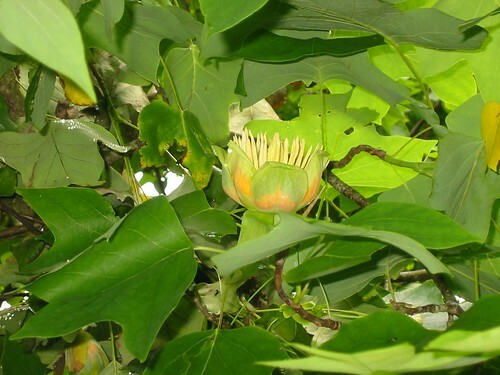 One of her treasured projects was a tulip tree Liriodendron tulipifera which grew bigger and bigger and bigger on one boundary of her plot but couldn't ever be persuaded to flower to her great disappointment. 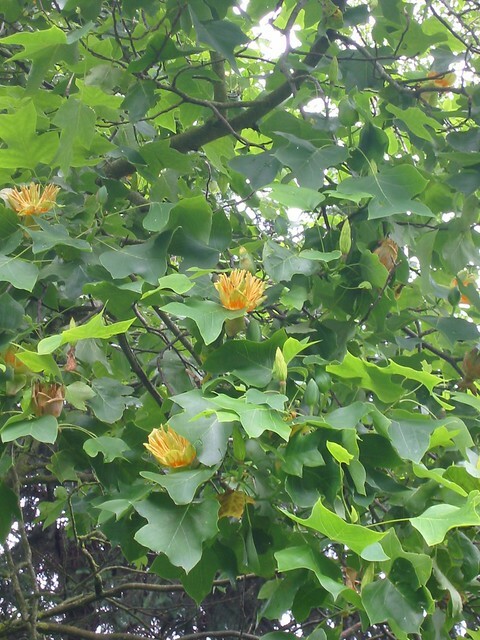 This tulip tree is in my garden in France and has flowered regularly for the last 10 years. Every time I see it I think of my aunt and hope she knows of it and feels my gardener's pride. Unfortunately, although it's a good year for tulip trees the weather hasn't really improved enough to bring on the vegetables particularly. The humid conditions have encouraged nearly terminal rust on the garlic and slugs on the seedlings to such an extent I've resorted to pellets even though I would prefer to avoid them. Today is dry and with regular warnings of Smith periods from Blightwatch for the Channel Islands (the closest area they cover to me) I'm trying again to give a prophylactic spraying of Bordeaux mixture to the potatoes. The later varieties are making some tubers now and if I can keep them blight free for a few more weeks we may yet have a useful crop. I can hope anyway. The runner beans are running but the other beans aren't really making much growth, the sweetcorn seems to be at a standstill and the courgette plants only just beginning to flower. I've never known a year like it and the longer range weather forecasts are all pretty gloomy for the rest of the year. The different conditions are producing some different vegetation. 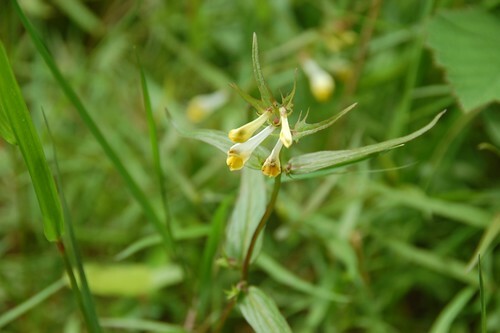 I'd never noticed this little flower before, a semi-parasitic weed of ancient woodlands called Common Cow Wheat or Melampyrum pratense. It is the food plant of the Heath Fritillary butterfly and if there were any butterflies this year it should be heaving with caterpillars but again, the weather is against it. I can't find a definitively good source about the plant to link to so I suggest you use your favourite search engine and read several entries to get a fuller picture. 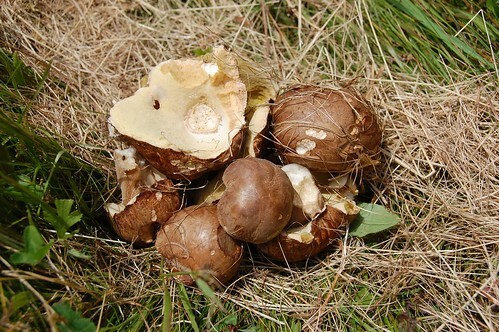 The unusual conditions did bring on an early flush of ceps, I spotted these from the cab of the tractor when grass cutting, but it's small recompense for all the waterlogging everywhere else.